Begrudgingly, I am coming to accept that this year, summer is never going to come. While it got warm, it never really got hot. The sun graced us with its glorious rays for a few weeks, but more often than not my beacon of summer was hiding behind a dreary, gray marine layer. Now the days are getting shorter, the nighttime temps are cooling and it is raining. Today I admitted defeat and actually... put on socks. Not that it was really that cold, I can't really complain at 65º, but it's wet and I had school volunteer duty, so the flip flops stayed on the shelf and out came the socks and real shoes. With the rain falling and my outside grill less of an option, I had to resort to inside cooking. On the bright side though, one of the benefits of this cool, rainy day is comfort food... cookies baked fresh and eaten warm with a cup of coffee for our afternoon snack and mashed sweet potatoes as our vitamin rich side for dinner. 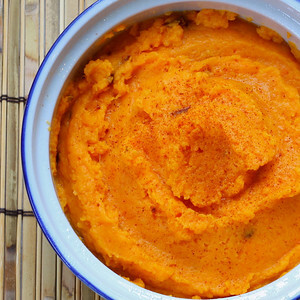 Cooking Light's Chipotle Mashed Sweet Potatoes has been a favorite of mine for years and allows me to have my mashed sweet potato comfort with a fresh, sunny disposition. Even my "I don't really like veggies" husband will eat them this way. Fresh with lime and spice of the chipotle peppers these creamy potatoes are sure to brighten up any dreary day! Place potatoes in a saucepan, and cover with water. Bring to a boil. Reduce heat; simmer 15 minutes or until tender. Drain and return the potatoes to pan. Add the half-and-half or milk, butter, and juice; mash to desired consistency (I like to leave mine a bit chunky!). Cook 2 minutes or until thoroughly heated, stirring constantly. 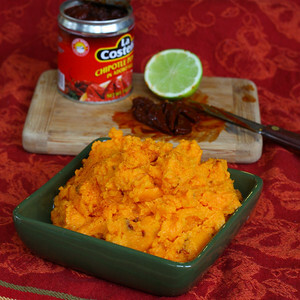 Remove 2 chiles from can and chop; reserve remaining chiles and adobo sauce for another use. Stir chopped chiles, brown sugar, and salt into the potato mixture and spoon into a serving bowl. Sprinkle with paprika for garnish. Alternatively, spoon the prepared potatoes into an ovenproof serving dish and heat at 375º for about 20 minutes before serving. Note: adjust the lime and chiles to taste. With 2-3 chipotles, those babies must be way spicy! I make CL's pork carnitas and can only take one chile in adobo. Does the sweetness of the potatoes tone down the heat? My husband loves spicy...I'm betting he would really like these!! I'll eat nearly anything with chipotles in it. Seriously. They are so good. Sweet potatoes will be tricky in my house because n o b o d y likes them but they have so many benefits to them I think if we acclimate ourselves we'll really like them! See I LOVE the fall. And this is a wonderful way to spice up those sweet potatoes - sweet spicy. Love it. I usually eat my mashed sweet potatoes with just a little orange juice added. I'll have to try this. This sounds like a new Turkey Day staple...YUM! Totally know what you mean. I live in LA, and we all patiently waited for summer to come. It came last week in the form of a heat wave, but ran away quickly. It's back to cold weather, and now we getting a lot of rain/lightning/thunder! Craziness. BUT on the bright side, it's perrrrfect weather for these chipotle mashed sweet potatoes! LOVE this recipe Kim, I like everything with some spice! Can't wait to try it! That sounds like the perfect side dish! Hmm. Interesting. I'll have to try this recipe. Thanks. Wow, this sounds like such a great side dish! Thanks so much for sharing it! On behalf of the people of Seattle, I want to apologize for stealing at least the tail end of your summer. You'll just have to come up for a visit... It's been glorious the past three weeks! Meanwhile, great recipe. Thanks for inspiring me to try mashed potatoes with a new flair! Delicious--I don't like super sweet sweet potatoes, so the addition of lime looks extra tasty to me. Down here in the southwest, I'm dying for some fall! I'd be happy to send some sunshine your way. Have you ever tried just simmering everything together? The Cooks Illustrated recipe for mashed sweet potatoes just simmers cubed sweet potatoes in a little butter and cream, which really concentrates the potato flavor. I am embracing the cold weather, you learn to do so in TX as it seems to rarely happen. I love sweet potatoes usually with some brown sugar, but the hubbie is going to love this recipe! Can't wait to try, thanks! Wow, I really like this. I have a few yams in my pantry I'm dying to eat. I think chipotle flavored is the inspiration I need. 65 F in Seattle is considered "great weather" haha. Oh, the rain. Totally get that part. This mashed potato dish is a great option for rain and cold weather. I like sweet potatoes and you added chipotle! oh yes. That's my cup of tea! Oh boy do these look good!!! What a heavenly match of sweet and hot! Btw, congrats on the Top 9! I love sweet potatoes and what a great way to serve them. Great recipe (= and congrats on top 9! Congratulations on the top 9. We like our sweet potatoes grilled or baked, but we'll have to try this one. This is what I call a fabulous recipe! Minimal ingredients and maximum flavor! Wonderfully creative! Love Sweet Potatoes and Chipotle. Great combo. Thanks for pointing it out to us! Mmmmm this recipe looks delish...and that's coming from less than a fan of sweet potatoes. You've got me thinking what a Mexican themed Thanksgiving dinner might be like....hmm. Thanks! btw...Congrats on the top 9! Wow! Yum! I can't wait to try this! I'm featuring recipe on my Friday Favourites feature this week! Feel free to check it out!